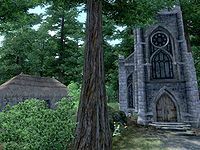 Gottlesfont Priory is a chapel and farmhouse between Skingrad and Chorrol. 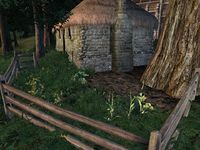 It is located in the Great Forest, directly southwest of Fort Wooden Hand, and slightly east of Brindle Home. The entire priory consists of a small church and a house with a garden. There is also an extra bed and food for travelers. The church has an altar which can cure diseases, which is useful when trekking in the wilderness. The priory is a useful source of alchemical ingredients. The residents will allow you to collect their Lady's Mantle plants, which are useful for Restore Health potions. The small garden contains more plants (see Ingredient Locations for details). Additionally, many previously harvested ingredients (Cinnabar Polypore Yellow Cap, Cinnabar Polypore Red Cap, Lady's Mantle Leaves, and Steel Blue Entoloma Cap) and food ingredients can be found in the priory and the house. All can be taken without it being considered stealing (even food in the cupboard) - just be sure not to accidentally take the baskets. The book Modern Heretics is written by Haderus of Gottlesfont. He refers to himself as "a chapelman and scholar". The Priory is also mentioned in Glories and Laments. This place is sometimes called Gottlefont Priory and sometimes Gottlesfont Priory. The two interior cells use the no-'s' spelling, but the exterior cell on the map uses the 's'. This page was last modified on 25 March 2017, at 16:37.